Before the paint had time to dry I was already working on the next step. 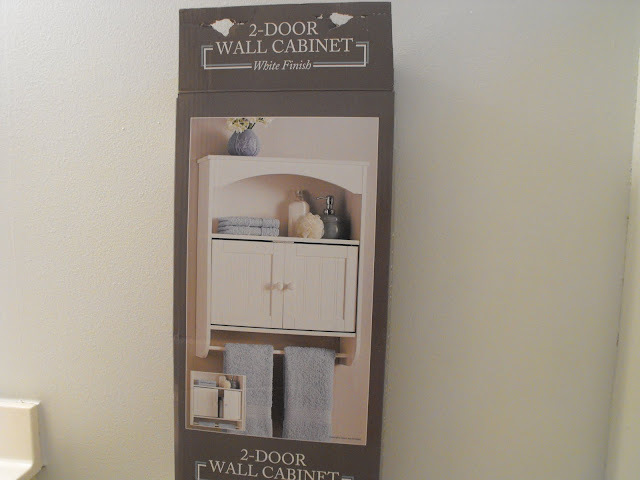 I purchased this cabinet at Wal Mart for under 40.00. I wouldnt say it is top quality but it does have some curb appeal and the box said easy assembly! 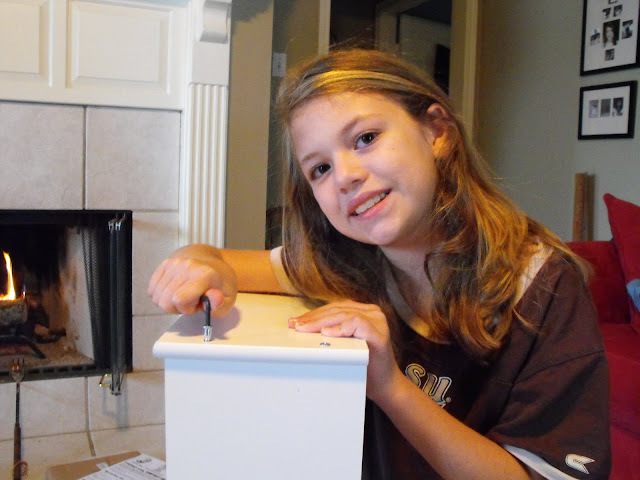 The kids were out of school Friday for a snow (ice) day so we had some fun decorating and bonding. The box did say easy assembly but hanging it was another story. My sweet husband was not having the best of luck hanging it. He is a stickler for finding a stud. Smud..stud... I always say. Just hang that baby with the help of those (rubber. no. studs. found. in .wall. thing. a .ma. jigies) and let her fly! That is just what he did too. Now because the cabinet was under 40.00 you can guess what kind of beautiful hardware came along posing as knobs....plastic! I overlooked that fact because it was so pretty with it's beadboard back panel and doors. I am so exicited about my little cabinet....we are on our way! I was so disapointed when I got one of those cabinets form my mom for free and we didn't have a place for it. Yours looks nice, and good call on the knobs! 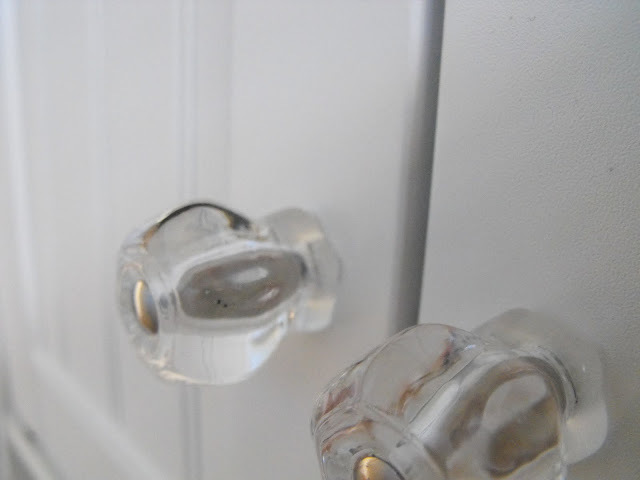 Your cabinet looks great and the glass knobs did the trick! So functional too. Must be a guy thing cuz my hubby always has to find a stud too! Well they are studs right!! 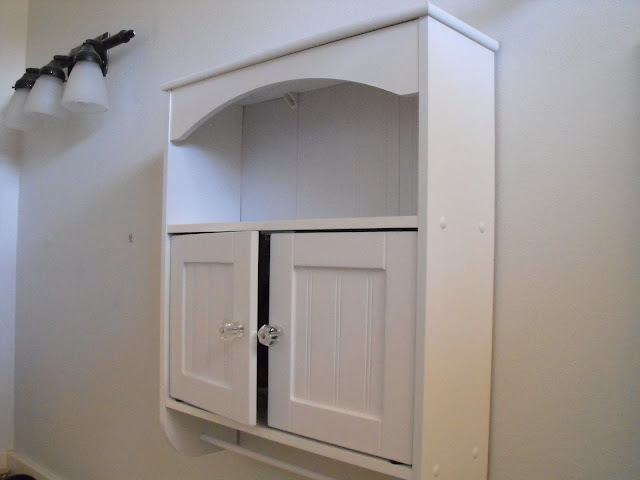 Cute cabinet. Susie, am loving those glass knobs. 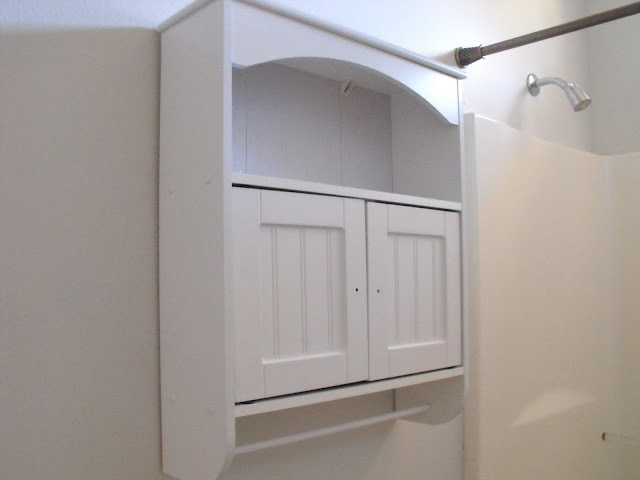 I have been looking for a cabinet like that with the towel bar to hang in our master bath. I have this great idea of doing a mini bathroom makeover when hubs is out of town. But I can't seem to find that particular cabinet around here. Glad you found it though. Looking forward to seeing the finishing touches you will be putting on this room. The glass knobs are such a beautiful touch! this is so pretty. i love the idea to change the knobs. they make such a difference. a good set of pretty knobs can change a lot!!! it's looking good so far!!! :) keep up the great work miss susie! Lookin good Susie and I love the glass knobs! I could use this in Caden's bathroom. 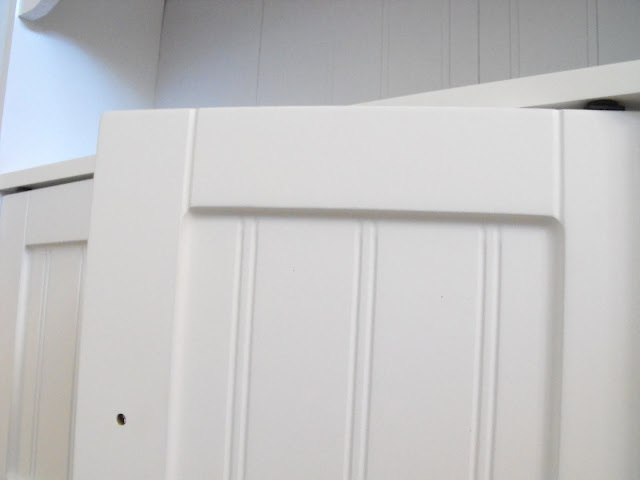 He has a large space of wall above the toilet and his cabinet is beadboard doors. I could paint it and it would match. Do you think it could be painted? Thanks for this great find. I hope I can find it at our Walmart. I was just there a couple of hours ago. This is so pretty! Love the knob exchange and I think Mr. Cabinet approves too! Can't wait to see the rest of the bathroom! I always love a good deal...and with those glass knobs, it looks high end! 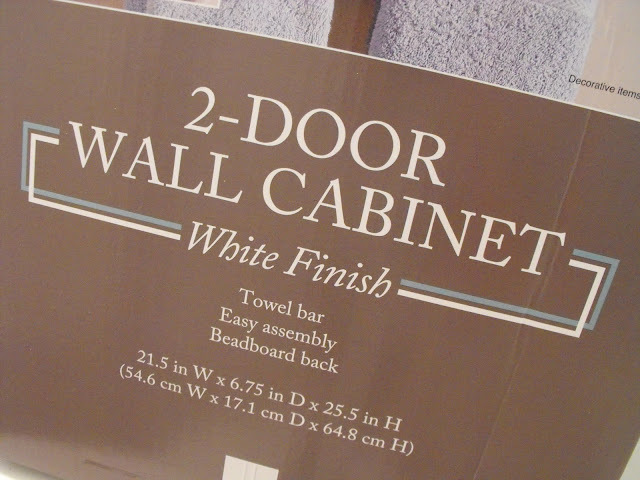 Susie, I'm loving seeing the progress of your bathroom. The cabinet is cute especially with your touch of the knobs. We have a cabinet similar to this in our master bath but it's oak looking. I've thought several times of painting it but haven't wanted to take the task on yet. What a good little find & I love her new jewelry. the bathroom is looking great! i think i might have to go pick up that little cab! and good for you for changing out those silly knobs! love it! Lovely...the cabinet and the daughter! 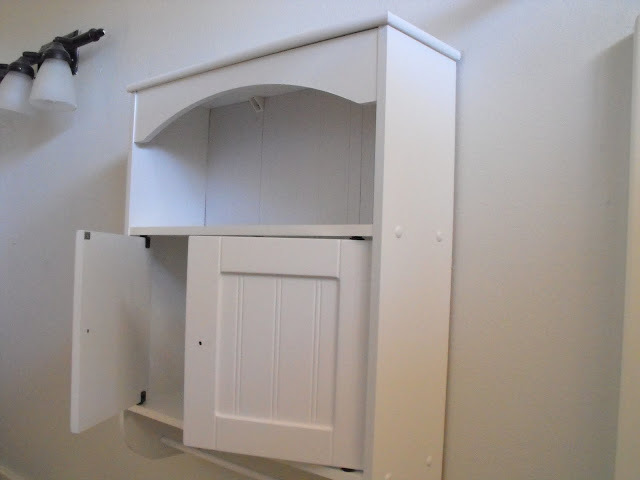 What a cute little cabinet! Just what I need in my bathroom. What a deal! 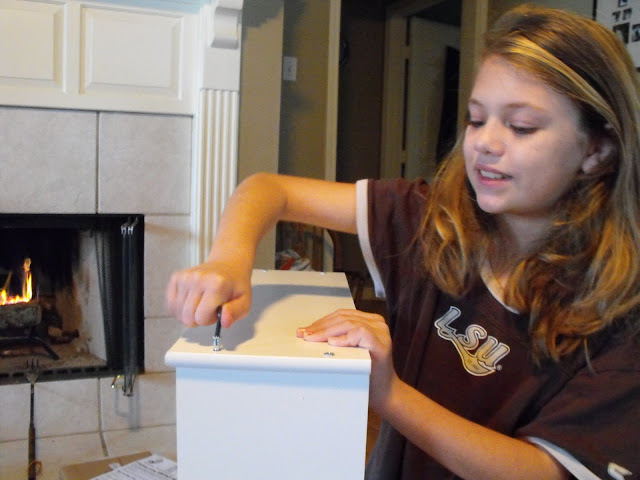 Those knobs are perfect as well...you are doing GREAT, girlie! Ooooh, Susie :) What a fun new look your little bath is going to have. Fresh, crisp, and happy. That's my kind of place to pee. Wow...that looks way more expensive than $40! Beautiful!